The Horizontal continuous casting machine consists of ladle rotary rack or ladle turret, tundish car, tundish, crystallizer, withdrawal device, flame cutting machine, dummy bar, billet rolling table, steel turning machine or pushing machine, cooling bed, and drawing machine. All the equipment of the horizontal continuous casting machine is installed above the ground plane and arranged in a straight horizontal direction. The process is that molten steel is injected into the intermediate tank from the barrel, and the intermediate tank is connected to the end of the crystallizer inlet through the bottom side link tube and the separation ring, and the molten steel enters the water-cooled crystallizer from the separation ring, around the inner wall of the crystallizer and the separation ring. Condensing molding, after the casting of the liquid core, is pulled out of the crystallizer, it is completely solidified by secondary cooling and cut into a fixed length to be used as a blank for the rolled material. Since the tundish nozzle and the crystallizer separation ring are connected in a horizontal direction, the molten steel flows along the horizontal passage, and therefore, the tundish is provided below the side wall of the tundish. The tundish is the intermediate container of the ladle and the continuous casting machine. It has the functions of storage, buffering, steady flow, slag separation and distribution of molten steel, and is the basis for realizing multi-furnace continuous casting. In order to achieve multi-furnace continuous casting, the capacity of the tundish should be greater than the amount of molten steel poured by the continuous casting machine during the replacement of the ladle. The withdrawal device is one of the most important equipment on a horizontal continuous casting machine. Its technical performance directly affects whether the horizontal casting machine can be poured normally. 1. It is necessary to have higher transmission accuracy, especially for the accuracy of reverse thrust, which requires positive and negative error ≤ 0.10mm. 2. Have enough rigidity to prevent the withdrawal device from vibrating. 3. To accurately control the time and speed of pulling, pushing and stopping. The withdrawal device generally adopts a clamp type frame, and the upper roller swings around the axial center to avoid the upper roller seat from being worn to cause the transmission gap. The dummy bar of the horizontal continuous casting machine is simpler and lighter than the dummy bar of the arc casting machine. Generally, the starting rod of the round blank horizontal continuous casting machine is a seamless steel pipe, the starting head is shaped, and the tail car is threaded. Combine it with the steel pipe. The storage method of the dummy bar is available in hanging and side shifting. Due to the relationship between the blanking and the reverse pushing operation, all horizontal continuous casting machines use rigid dummy bar. The casting slab after flame cutting run forward along with the roller table. When the front end of the casting slab collides with the tail baffle of the casting billet, the slab is sent to the CCM cooling bed by an electric interlocking device or a steel turning machine or a pusher. On the cooling bed, the casting slab is run forward along the cooling bed by a steel pulling machine. Then, by the slope of the cooling bed, it slides down into the slab lifting rack and is hosted by the overhead crane to the cooling zone for stack cooling, inspection, and finishing. ● Since the equipment arranged horizontally, body low can be installed in the existing plant, the low capital investment. ● High quality of cast strands. 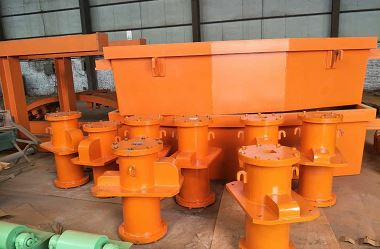 Since the tundish the crystallizer is directly connected, to prevent the secondary oxidation and inclusions in molten steel is easy to float in the middle of the pack, improve steel cleanliness. Especially suitable for high alloy steel casting. ● It can be directly cast into a small cast slab (e.g. 70mm billet), and even a few millimeters of wire rod, it can be made a minimum of rolling over the end product, greatly reducing the metallurgical production processes. ● Good security and reliability, due to the level of equipment arrangement, once the breakout burning fewer for subsequent equipment, and in Horizontal Continuous Casting and have a special monitoring device breakouts can be monitored. ● The tundish and the crystallizer are closely connected through the nozzle and the separation ring, and the molten steel has no secondary oxidation, which can improve the purity of the casting blank. At present, Horizontal continuous casting furnace is suitable for small and medium steel mills and the production of the small cross-section to match the casting slab.